Published: Jan. 24, 2016 at 04:03 p.m.
Denver Broncos quarterback Peyton Manning connects with Owen Daniels, who makes a fantastic double move to get open in the end zone, for Daniels' second touchdown of the AFC Championship Game. Published: Jan. 24, 2016 at 03:24 p.m.
Denver Broncos quarterback Peyton Manning finds tight end Owen Daniels wide open over the middle for a 21-yard touchdown catch to open the scoring against the New England Patriots. Published: Nov. 8, 2015 at 06:59 p.m.
Broncos Peyton Manning 1-yard touchdown pass to Owen Daniels. 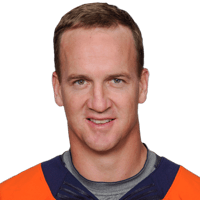 Published: Nov. 8, 2015 at 06:31 p.m.
Broncos Peyton Manning finds Owen Daniels for 37 yards.